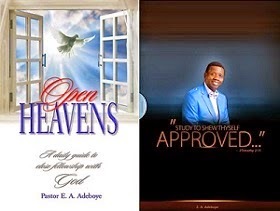 Open Heavens 2014: Wednesday August 20, daily devotion by Pastor E. A. Adeboye - Going in Circles? We need to remember that this whole scenario started with Abraham receiving an unsolicited promise of a land flowing with milk and honey from God. Many years had passed and the descendants of Abraham had lost both hope and interest in the promise, but God revisited them out of love and compassion. He delivered them from oppression and slavery with a strong hand. He did many wonders in the wilderness to prove He is a mighty God. He fought their battles and defeated all their enemies. Above all, He blessed them and made His tabernacle with them. God had done so much for them to justify His expectation of simple appreciation, trust and obedience. The least that God expects from His children is this, and He is disappointed when we fail in this regard. Consequently, God made them wander about in circles in the wilderness for forty years. I challenge you to take a critical look at your life. Are you making progress or going about in circles? Are you in good standing before God? Is everything alright with your spiritual, family and business life? Are you doing well physically, financially, and emotionally? Are you suffering from stagnancy in any area of your life? If anything is amiss, turn to God in prayer now. Prayer Point: Father, put an end to going in circles in my life and empower me to make progress. Open Heavens Daily Devotional is written by Pastor E.A. Adeboye, the General Overseer of the Redeemed Christian Church of God, one of the largest evangelical church in the world. He is also the President of Christ the Redeemer's Ministries.